If you could survey 600 digital marketers and ask them what marketing channel had the biggest impact on income, what do you think they would say? Fair question. Here’s he answer. For Business to Business the biggest impact on income is from email marketing. This is followed by Search Engine Optimization – This is the process of enhancing the visibility of a website so it ranks higher on search engine pages. Then Paid Search. With paid search you pay a fee to have your website displayed on the search engine results page when someone types in specific keywords or phrases to the search engine. Then comes Social Media – Facebook, Twitter, LinkedIn, etc. Display Ads are then tied with social media for effectiveness. Social Media and Display Ads are the least effective drivers of income. The results are slightly different when seeking to sell to consumers. 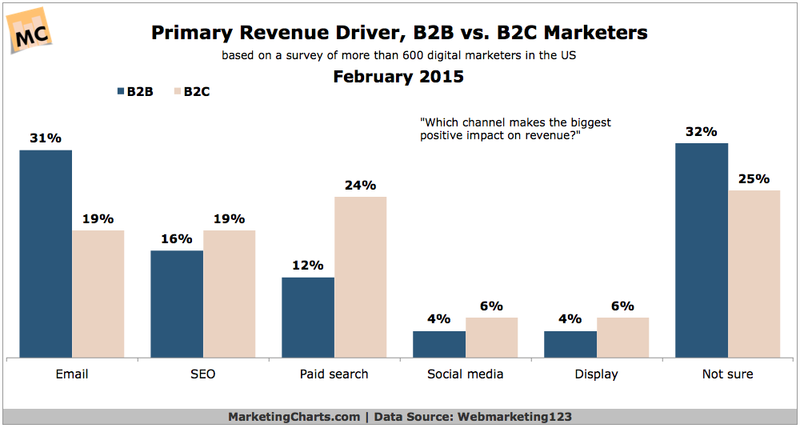 The most effective marketing channel to consumers is Paid Search. Email marketing and SEO are tied for the second most effective channel to generate revenue from consumers. Social Media and Display Ad are the least effective at generating revenue from consumers as well as businesses. Of course, when you have surveyed your public to get the most effective marketing message, any of these channels will preform even better.